Adorable Monique is an award-winning artist based in Southwest Florida, brought up abroad in Central America. Having the good fortune to be mentored by a renowned artist has enriched her artistic vision, prior she received her formal education in Fine Arts and Teaching. She has received numerous awards and the opportunity to exhibit in various venues. Growing up surrounded by different cultures has broadened her overall view of life. She is continuously pursuing success in personal, professional, and artistic endeavors as well in the artistic experience itself. My artwork explores aspects of our natural world and human experience I intend to portray the inner beauty of things and complexities, our natural environment which represents life and the water that nurtures the land with fertility and knowledge. I believe in the mission and vision to preserve the natural resources, with the hope that my art may speak to the audience to create consciousness towards nature. I like to showcase women surrounded by natural resources, also, birds, which represent freedom and rising high as a metaphor to achieve aspirations and goals. Shapes that would represent stages of transformation, while embracing traditions, beliefs and self-identity. Also, the importance of cultural heritage since it makes our lives great, not only because of who we are, and our diversity, but where we are headed. Among some of Monique's awards are in public art such as murals, workshops, designing custom designs on furniture and paintings. Prize award for creating the designs for the library bus or Bibliobus. The project involved the task of painting the surface with automotive primer, paints, sanding, sealer. The design showcases an array of colors, the image of earth represented holding a book featuring the flag of Honduras, rendering homage and embracing the importance of Cultural Identity. Shapes of colors represent diversity, emotion, dreams and imagination. This project was sponsored by UNESCO, Plasmon and The National Library of Honduras Juan Ramon Molina BINAH. The main purpose of this project was to introduce reading to underprivileged children and adults. To experience the magic world of reading. Commissioned with Commemorative Artworks. Selected in the first symposium of artists of the world celebrated in Honduras, sponsored by the United Nations headquarters of Honduras PNUD, The First Lady and The Mayor’s Office, with the title of the mural “Growing is Believing” which is located in the Building of Children’s and Families best known as IHNFA. 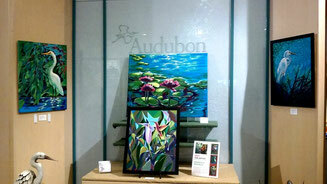 Featured artist in plein air events such as the Third on Canvas juried Plein air & Auction. 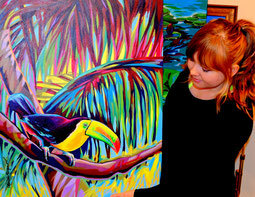 Her work has been juried and showcased in venues: Rookery Bay National Estuarine Research Preserve, Audubon Corksrew Swamp Sanctuary, Fredrick Watson Gallery, Norris Center, Marco Island Executive Airport, Piq' Latin American Art Gallery, Banco Central de Honduras, City Hall of La Ceiba, Atlantida, Honduras,FGCU. Monique has also contributed to local and abroad charities and fundraisers. Some of Monique's artwork have been featured in The Annual Book Collection of The National Library of Honduras Juan Ramon Molina BINAH with the titled works Azul, Serenitud and La Leona, Professional Art Mag, Artist Portfolio Magazine. Illustrations and paintings have graced the covers of books and magazines such as The Anthology of Poetry by the Association of Writers of Honduras ANDEH, children’s books such as Las Historias de Natalia, Silencios Habitados (Honduras), Cuentos África (Spain), literary journals, The Naples Illustrated: Charity Register magazines, The Spotlight Magazines. Among her winnings with posters, Enlightenment was the design contest winner of The Friends of the American Latino Museum theme To Illuminate the American Story for All. During the 6th Annual Design Contest. Rising Notes poster winner of the 9th Annual poster contest, The Sunny Isles Beach Jazz fest. Public Installation in The Boardroom of Collier County Commissioners Board, Naples, FL, Selected Billboard Image Exhibit in Sarasota, Florida. Third place in the Photograph competition, in the professional category, celebrated by PLAN International in Honduras. Selected winner with the photo titled Entorno Mágico Representing Honduras in the International juried photo exhibition, organized by the Hispanic Canadian Arts and Cultural Association, during a celebration of the diversity and vibrancy of the cultures in the 41 Pan American countries through the lens of photography. Toronto, Canada. Mural award for creating the winning mural concept for the Harry Chapin Food Bank of Southwest Florida, Fort Myers, Florida. Honorable Mention in ceramics Metamorphosis: Man-Nature during the III Biennale of Arts of Latin America and The Caribbean sponsored by The CAC-UNAH, and Honorable Mention for Mother during the IHCI Biennale of Latin America and The Caribbean celebrated in Honduras. Honorable Recognition for the beautification of the Campus of La Escuela Normal del Occidente, with the mural Un Tributo a los Educadores, inspired in the landscape of one of the most important sites in the region, The Chiligatoro lagoon. La Esperanza, Intibuca, Honduras.